Indonesian geography is dominated by volcanoes formed by a subduction zone between the Eurasian plate and the Indo-Australian plate. Some of the volcanoes are known for their eruptions, such as Krakatau, whose eruptions were globally impacted in 1883, a suspected Lake Toba eruption eruption that occurred 74,000 years before now that led to a volcanic winter for six years, and Mount Tambora with the greatest eruption ever recorded in history in 1815. Indonesia has 127 active volcanoes with approximately 5 million inhabitants dwelling around them. Since 26 December 2004, after large earthquakes and tsunamis have occurred, all volcanic eruptions have changed, for example, Sinabung, which last erupted in the 1600s, but suddenly reactivated in 2010 and erupted in 2013. The shape of the earth’s surface in Indonesia varies, because there are flat, wavy, some are high and some are low. The shape of the earth’s surface is thus called the relief of the earth’s surface. The shape of the earth’s surface relief is not fixed, but always changes from time to time. Changes in earth surface reliefs occur because of the geological power, the forces of the earth from the forming (endogenous) and exogenous energy. Earth’s surface reliefs include the various forms that exist on the land and the sea floor. Most of Indonesia’s mainland reliefs can be distinguished over coastal areas, lowlands, and highlands or mountain areas. Indonesia has many mountains and mountains because it is crossed by two paths of young mountains, the Sirkum Pacific and Sirkum Mediterranean. The Mediterranean sprouts extend from Indonesia to the west of the Himalayas, the Mediterranean, and the Atlantic. This difference in the Pacific and Mediterranean circumcision is not a subduction, but the result of a collision between continental plates. This is why the Himalayas are the second earthquake prone area after the Pacific Circumference. In the eastern part, there are three tectonic plates such as Philippine, Pacific, and Indo-Australian plates. Subduction between two plates causes the formation of volcanoes and ocean trenches. Similarly, the subduction between the Indo-Australian Plate and the Eurasian Plate causes the formation of a series of volcanoes that are none other than Bukit Barisan on Sumatra Island and volcanoes along the islands of Java, Bali and Lombok, as well as the ocean trenches which are none other than the Java Ditch (Sunda). Indonesia is also a geologically unique country because it is at the center of the collision of the Indian Plate of Tektonik in the south, the Eurasian Plate in the North and the Pacific Plate in the Northeast. This resulted in Indonesia having a complex tectonic order from the direction of the collision zone ie Fore arc, Volcanic arc and Back arc. Fore arc is an area directly adjacent to the collision zone or often referred to as an active zone due to fractures commonly found on land and at sea. In this area the main constituent material of this environment is also very specific and contains the potential of natural resources of the mining material large enough. Volcanic arc is an active mountainous pathway in Indonesia that has distinctive topography with distinctive natural resources as well. Back arc is the very back of the relatively stable series of tectonic arcs with a nearly uniform topography that serves as a place of sedimentation. All these areas are unique and uniquely rare in other areas, both biodiversity and geological diversity. (a) The deep bow, through the Bukit Barisan mountains in Sumatra, Java, Bali, Lombok, Flores, Alor, Wetar, and ends in the Banda archipelago. These mountains are volcanic. (b) Outbound, through the islands to the west of Sumatra island (Simeleu Island, Nias Island, Mentawai Islands, Enggano Island) and then crossing into the underwater mountains to the south of Java Island, Sumba Island of Timor, Bahar Islands, Tanimbar Islands, Kei Islands, Gorom Island, Seram Island, Ambon Islands, and ends on Buru Island. These mountains are non volcanic bersifak. Meanwhile, the central and eastern parts of Indonesia are part of a series of Pacific Sirkum Mountains with acidic rock properties. Sirkum Pacific across Indonesia through 3 lanes, namely Kalimantan, Sulawesi, and Halmahera. It then continues to the heads of Papuan birds and forms the backbone of mountains in Papua, Australia, and ends in New Zealand. Pacific Ring of Fire is an area that often experiences earthquakes and volcanic eruptions that surround the Pacific Ocean basin. This area is shaped like a horseshoe and covers an area of ​​40,000 km. This area is also often referred to as the Pacific earthquake belt. Indonesia is located in the ring of fire, along with a number of other countries such as New Zealand, Philippines, Japan, Indonesia, USA, Russia and Chile. Fire rings are formed because the oceanic plates slide down the continental slab. The fire ring has 452 volcanoes, whether active or not, or about 75% of global accumulation. Approximately 90% of the world’s strongest volcano eruptions occur within the ring area of the fire. And Indonesia has more than 30% of total volcanoes in the world. About 90% of the earthquakes occur and 81% of the largest earthquakes occur along this Ring of Fire. The next quake area (5-6% of all earthquakes and 17% of the largest earthquakes) is the Alpide belt that extends from Java to Sumatra, Himalayas, the Mediterranean to the Atlantic. Next is the Mid-Atlantic Ridge. The Pacific Ring of Fire contains about 400 volcanoes in Indonesia, with 130 of them active volcanoes stretching from the island of Sumatra, the island of Java, then across to Bali, Nusa Tenggara to the eastern part of Maluku and turning north to the island of Sulawesi. Nevertheless, this makes the soil of Indonesia fertile and rich in minerals. In Indonesia there are collisions of three continents plates, namely Indo-Australia from the south, Eurasia from the north, and the Pacific from the east, which resulted in Indonesia is in a disaster due to volcanic eruptions, earthquakes, and tsunamis. The volcano is a mountain that has a crater or fracture hole in the earth’s crust where the discharge of magma fluid or gas or other liquids to the surface of the earth. The characteristic of a volcano is the presence of a crater or fracture. At times the volcano can erupt. Most of the mountains in Indonesia are active volcanoes. The characteristic of an active volcano is the presence of volcanic activity such as gas bursts, fumes, and bursts of material from within the volcano. In Indonesia, most volcanoes are scattered throughout the island of Sumatra, Java, until Nusa Tenggara. Volcanoes are also found in Sulawesi and Maluku Islands. Some volcanoes in the archipelago are very famous in the world because of its very powerful eruption, namely Tambora and Krakatoa volcanoes. Those are the brief explanation of the reasons why are there many volcanoes in Indonesia. 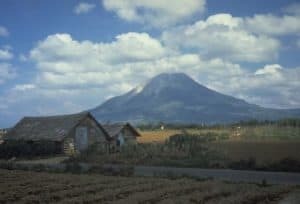 It has been thousands year Indonesians live in this dangerous area, however, they could still live peacefully without any fierce of volcanoes eruption.